There is a tunnel at the top of the Transfagarasan pass that connects both sides of the mountain. It is not very long, maybe one and a half kilometers, but it is very narrow, with just enough space for two cars, the road surface is broken asphalt almost turned into gravel with the occasional big pothole and it is pitch black, there is not a single light in it. When I rode it two days ago, the fog that covered the top of the mountains had also got into it, so visibility was almost zero. With the screen covered in moist, I had to stand on the footpegs to see over it, and I could see no further than eight or ten meters, the headlights hopelessly trying to pierce the fog. Had you asked me this morning, I would have said that was the most frightening experience I had ever had on the bike, but what I did today was far, far worse. In the morning, Igor took me to an ATM so I could get some local money and then to the bike. I loaded it and checked the oil, a bit worried about a developing leak that I had spotted in Romania. When I started the journey I noticed a bit of oil on the bash plate, but since I had had the valve clearance checked and it was a job that required opening the engine, I thought that it had got dirty then. Just to be sure, I checked again when I got to Budapest, and things seem to be the same. 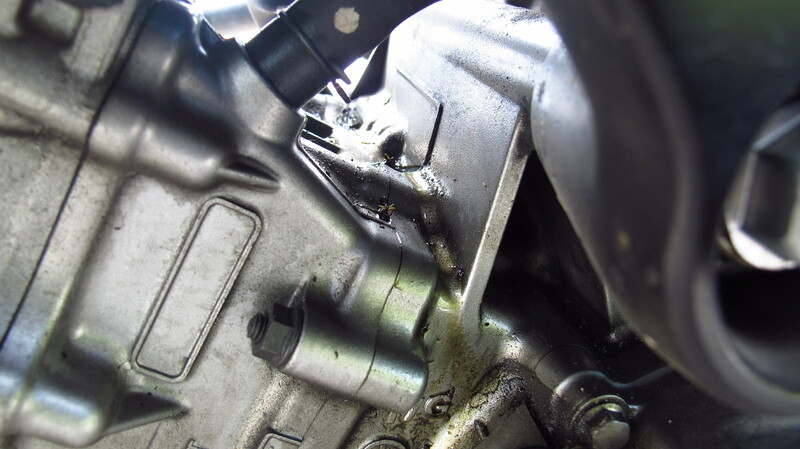 However, once in Romania I noticed that there was a bit more oil, and on closer inspection I discovered that there was oil in the V where the cylinders meet, and it seemed to be coming from somewhere in the back of the front cylinder. I cleaned it to see how long it would take to get dirty again, and today, after two days and about 1,200 km, enough oil has accumulated in the V to leak down the side of the engine. In normal riding conditions, it would take weeks for that much oil to leak, since I barely do more than 20 km a day, but things happen faster on the trip. I cleaned it again near Kiev to check how long it takes this time. The oil level has been descending at a normal rate for the number of kilometers I have been doing, so I do not know how worried I should be. I will be in Volgograd in three days (1,200 more kilometers) and since I need to have the bike serviced there, I will have the leak checked. I hope it does not get any worse before getting there. I said goodbye to Igor, who refused to let me pay for the car park, thanked him for his hospitality, and went across Lviv center to get the road to Kiev. It is a shame I did not have more time to visit the city, as what little I saw from the bike was great. What was not so great was the time it took me to get out of there, through streets clogged with traffic, and cobblestones and tram rails to make things more challenging. Once out of the city the road was good an clear all the way to Kiev. The landscape was beautiful, green fields stretching far, but it was one of the most boring rides so far. After my last experience with the police I was not going to give them a reason to stop me, so I stuck to the speed limit (90), and did not overtake unless it was legal. Since I was the only one following traffic regulations, that meant that I was the slowest thing on the road, and on roads that were mostly straight and smooth, I had to fight hard to stay alert. On the plus side, I managed to get the best fuel economy form the bike ever – 4,1L/100km for the whole journey. As soon as I got to Kiev things changed quickly, little did I know that I was in for a hell of a ride. Luda, my host’s secretary, who speaks some English, had told me to meet her at an underground station on the main road on the city limits, because it would be easier if she showed me the way from there. I was glad she had taken the bother to do so, as navigating big city traffic is usually hard. She got on a cab and told me to follow it. I thought it would not be very far, since she had come to get me, but boy, was I wrong! The cab driver sped off into the afternoon rush hour traffic in 8-lane avenues chocked full of cars, trucks and buses, and I was left to do my best not to lose him. I was determined not to, and that meant sticking to his tail, absolutely no safety distance to speak of, and even so, the moment I left a couple of meters between me and him, somebody would try to get in the gap. And all that at speed well above what you would expect in the city. I could not even check the mirrors, as taking the eyes off the car in front for even half a second might mean an accident. And on top of that, the roads were badly potholed, which meant that the ABS was constantly kicking in, providing some extra scariness tot the whole experience, and obviously, riding so close to the car in front I could not see the potholes in time, so I basically ate them all. 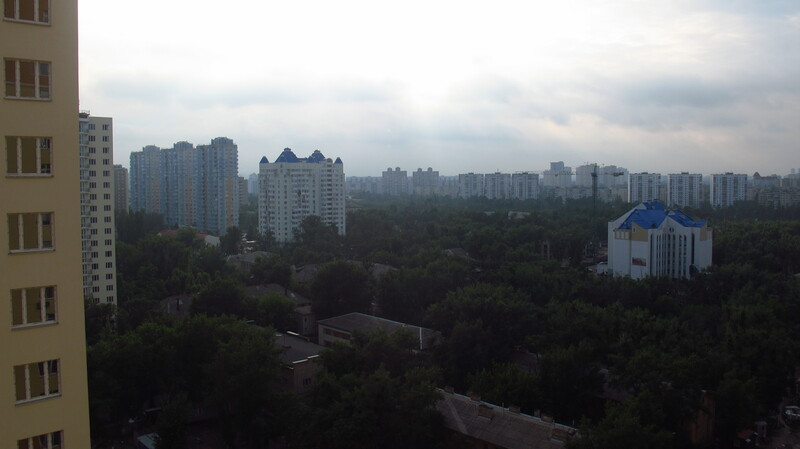 After the longest ride of my life, we got to the apartment, on the 14th floor of another soviet-style building, and I was shown into the shower and then sat down for another enormous dinner consisting of the finest traditional Ukranian dishes. Luda made her best to translate for me, and I managed quite a conversation with Sofia, my host. 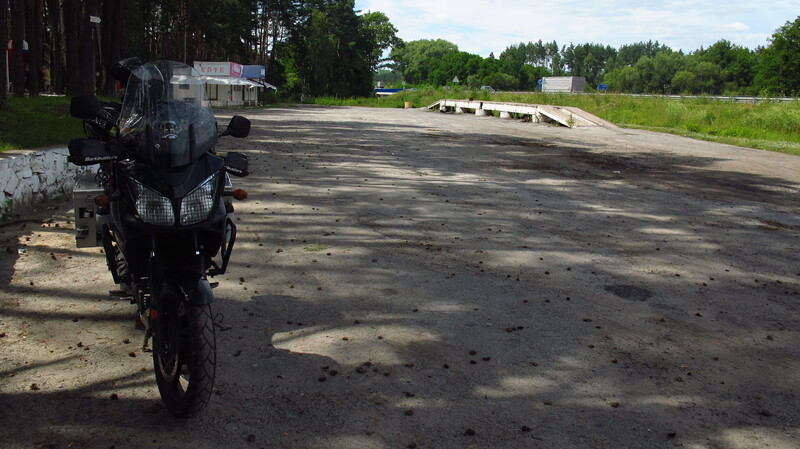 After dinner, a friend of hers told me he would lead me to his car park, where I could securely leave the bike for a couple of days. I followed him, fearing another crazy ride, but by that time the streets had emptied, and it was a lot easier. We left the bike there and he drove me back to the apartment. Sitting on the back of his plush car, I almost dozed off after the adrenalin rush of the afternoon. 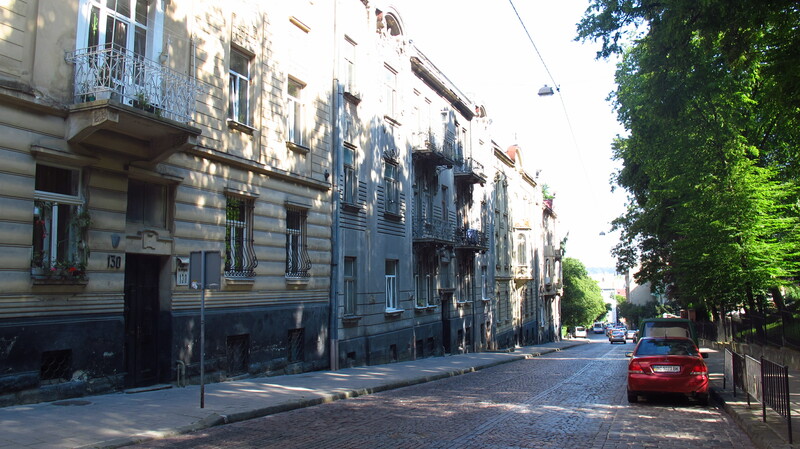 This entry was posted in Stroming The World 2013, Travel and tagged Kiev, Lviv, rush hour traffic by Kilian. Bookmark the permalink.